More than 1000 local jobs will be created after the Andrews government announced a $2 billion package to build 65 new high-capacity trains in Melbourne's west had been granted to an international consortium. The decision has been welcomed by many due to a 60 per cent local content requirement, but the Australian Workers Union says it is "heart-breaking" that some jobs will be sent to a Chinese firm with a poor record. The Andrews government has announced a $2 billion package to build 65 trains in Melbourne's west. Video supplied by Victorian Government. The consortium Evolution Rail is headed by Downer Rail and the Chinese-owned CRRC, with finance from the Plenary Group. The Plenary Group is a big donor to Victorian Labor, giving $48,650 to the state branch last financial year. The AWU, which represents workers at rival bidder Bombardier, has previously warned that the subsidiary of CRRC, Changchun Railways Vehicles has a poor track record. The trains will be 20 per cent longer than the existing fleet and help boost capacity across the network. They will be assembled in Newport at Downer Rail. The decision by Labor follows a 12-month tender process. Premier Daniel Andrews said the package would include 60 per cent local content, as well as a requirement for 15 per cent of the workplace to be apprentices and from disadvantaged backgrounds. Mr Andrews said the project would create 1100 jobs. The $2 billion public-private partnership will last 35 years and includes maintenance. A new stabling and maintenance depot will be built in Pakenham East creating 100 jobs. The first of the 65 trains are due to be tested on the network in November 2018, the same month the next state election is due. Mr Andrews also announced that another nine six-car trains had been ordered from Alstom in Ballarat. Downer's Newport facility will also undergo a $16 million upgrade and CRRC will set up a new regional headquarters in Melbourne. "The state's largest single order of new trains will be built in Victoria, for Victoria," Mr Andrews said. "We have a consistent policy and it is one that says let's put people first, let's make sure Victorian taxpayers' dollars support Victorian jobs." A special partnership has also been struck to help transition Toyota workers into the locomotive sector. AWU state secretary Ben Davis said trains built by the Chinese company for Singapore in the past had serious structural problems and there were reports from South Africa that CRRC did not meet its promised local content. He said Bombardier would have provided 70 per cent local content. "The decision is plain wrong when $2 billion of Victorian taxpayers' money goes to a contractor with a track record of not delivering the goods, or the jobs," Mr Davis said. "The contract should have gone to the bidder who would create the most local jobs. It is beyond disappointing when jobs go to China, but this is heart-breaking to see what should have been a manufacturing boost for the state turned into little more than an assembly project." Mr Andrews used the announcement to attack the previous Coalition government's procurement record as well as attack the Turnbull government for its navy ship building strategy. The announcement was immediately welcomed by the Australian Manufacturing Workers Union. "This announcement not only provides security and certainty to hundreds of workers and their industry, it also commits to long-term jobs and training opportunities for a new generation of highly-skilled workers," said AMWU State Secretary Steve Dargavel. SERIOUS doubts have been raised about a Chinese company’s ability to deliver on its local content requirements for a $2 billion train fleet. The Andrews Government today announced the winning tender to build 65 new high-capacity trains in Melbourne’s east had been granted to the China-backed consortium Evolution Rail. The winning bid — which includes the Chinese state-owned CRRC — has promised 1100 local jobs will be created with a 60 per cent local build. Premier Daniel Andrews hailed it as “trains for Victorians built by Victorians”. But the Herald Sun has learnt the international consortium will import all of the carriage shells from overseas for the project. It is understood the unsuccessful Bombardier bid, which already makes trains in Dandenong, had committed to a 70 per cent local build. Australian Workers’ Union state secretary Ben Davis said CRRC had a record of “structural defects and of not honouring local content obligations”. He said the China-backed bid would assemble “a glorified Lego set” in Victoria. “It’s a real shame that the business which has the highest local content didn’t get chosen, because the higher the local content, the higher the local jobs,” Mr Davis said. As CRRC has embarked on an aggressive expansion over the past two years, concerns have been raised about its record of honouring local content obligations in a number of countries. South African authorities recently launched an audit of 1064 new locomotives after CRRC was accused of not providing satisfactory information about its local build for a US$3.6 billion project. In Turkey, the company was accused of “breaching project contracts” for not meeting local build requirements in 2014, according to a report by television channel Dunya News. And Singapore has returned 26 defective trains to CRRC, three years after delivery. The new train package for Victoria also includes a requirement for 15 per cent of the workplace to be apprentices and from disadvantaged backgrounds. A partnership has also been struck to help transition Toyota workers into the locomotive sector. The new trains have 20 per cent more space to deal with overcrowding. Transport Minister Jacinta Allan said there were strict audit and compliance provisions to ensure the local content requirement was adhered to. “Unlike the former Liberal Government, who were going to build every single one of their new trains in South Korea, we’re ensuring our new trains are built in Victoria, by local workers,” she said. Ms Allan said a further nine X’Trapolis trains would be built by Alstom in Victoria, as part of the rolling stock strategy that delivered $300 million of work to Ballarat. CRRC was contacted for comment. Earlier, Premier Andrews said the new trains would be used on the Cranbourne-Pakenham line from 2019 once new stations are built and nine level crossings removed. Mr Andrews said the order was part of the 10-year rolling stock strategy, and would lead to a better public transport service. He said with ship building under pressure in Melbourne’s west it was important to ensure job growth and work for high skilled industries. “The state’s largest single order of new trains will be built in Victoria, for Victoria,” Mr Andrews said. The new high capacity trains have 20 per cent more space to deal with overcrowding. Ms Allan also said new trains were critical to the system, especially when the Melbourne Metro rail tunnel was opened by 2026. “This is every train we need to boost services in Melbourne’s south east and run the turn-up-and-go services we’ll deliver by building the Metro Tunnel,” she said. I would expect similar commentary regarding local content and the involvement of CRRC in the deal as we would have seen in relation to the Waratah contract in Sydney (as it is basically the same players). One could also see the disagreement between the AWU and AMWU over the result as basically a demarcation dispute (I haven't checked but I would expect that the AMWU would have coverage over Downer's workers). Also, Bombardier does have a fair bit going on already with the E-class tram build and the ongoing Vlocity build, and its bid would certainly not have been helped by the defective Vlocity wheel issue earlier this year. I fully expect that those who would have welcomed a fully off-shored contract awarded by Dennis Napthine and Terry Mulder (had they won in 2014) will bemoan a 60% local content requirement instead of 70% solely because it was awarded by Labor. In the TV report, there was a hint of another major announcement some day or week soon. The hint seemed to be in respect to E class trams and V/Line. Add to the rumors of an E1, E2 and E3 class trams, I wonder if there may be an announcement of these very soon? Also, with the V/Line, we are either going to get more Vlocities, or, an order of the new 'InterCity' variant to replace the N sets. Lastly, the reawarding of the tender for Metro is due by the years end. Well there is the news of Metro entering into discussions with the government regarding their contract - most likely for an extension although anything is possible at this time. Any announcement regarding trams would be simply to exercise the option for more E-class trams (and I'm not sure where you are getting the idea of variants of E-class trams from), while there will be work on developing the next regional train (which I'm thinking would be either a direct replacement for the N sets or something that would allow Vlocities to be cascaded to Long Distance duties). I have heard that there may be an E2 variant, which will have a revised cab to improve driver visibility. Classic spin from the government and from its agencies. 'Creates x jobs', when it could have created 2x jobs. More importantly, the trains are not high capacity. Nowhere has anyone stated the capacity, but certainly it is nowhere near the 2000 capacity which could have been purchased. Ever since DoT was created by the 1992 Liberal government, it has based all planning on nine-car single-deck trains on a system where the only nine-car platforms are at Flinders St and Flemington Racecourse, and which the underground loop can't handle. The cost of increasing clearances on existing lines for double deck trains would have been nowhere near the cost of building Swanston St tunnel and the elevated Dandenong line to cope with these seven-car trains. If you'd bothered doing some actual reading, you'd know the stated capacity is 1380 per 7-car unit. Roderick Smith wrote: Classic spin from the government and from its agencies. When they get boosted to 9 car trains the trains won't even be going through the loop. They're going via the metro tunnel. Most of the platforms along the Pakenham/Cranbourne lines will be extended. Double Decker trains might hold more people but they're offset by the longer dwell times. Longer dwell times equal less trains. PTV will do absolutely everything which it can to introduce proper high-capacity double-deck trains, and the Pakenham line was already one which had the clearances. This piecemeal platform lengthening may be because the interim seven-car solution does fit many, possibly by stopping with precision with cabs off platforms, but doors in [Skitube does that]. I guess that the fit the loop platforms, but possibly in the same manner. Animation recreation of the proposed higher-capacity metro trains and upgrades to lines and stations. (Vision: supplied). 170217F -Melbourne 'Age' - longer platforms. 170217F Melbourne 'Herald Sun' - longer platforms. I'm still wondering what they will be doing with Narre Warren Railway Station. Will a platform be extended or will they build a new station and grade separate Webb Street. i am doubtful. I have never noticed any enthusiasm in Victoria for double-deck trains, and the fashion in NSW Is strongly against them. That is only because of importing from UK: 'We don't have them, so those ruddy colonials shouldn't'. Nothing else shifts as many passengers per hour per track. The NSW passion is to kill the unions, not to transport people. Management keeps on propagating myths, and even transport enthusiasts fall for them. Meanwhile, Sydney has gone back to double-deck buses. Leyland B21 wrote: I'm still wondering what they will be doing with Narre Warren Railway Station. Will a platform be extended or will they build a new station and grade separate Webb Street. Perhaps it is already long enough? The length of the new trains (7 cars) will be 160m. The platforms at Narre are 163m long. 9-10 car trains aren't coming for some time. Yep, we can't think about 9 car trains until after the Metro Tunnel is open in 2026 or so, given the length of the City Loop platforms. because between 10 and 12 carriage railcar is current in use in Tokyo Japan. neilrex wrote: i am doubtful. I have never noticed any enthusiasm in Victoria for double-deck trains, and the fashion in NSW Is strongly against them. Not sure if it's been covered before but the new metro trains may feature auto stabling technology. Now If a union heavy RATP can get it trialled, the RTBU should ask their French counterparts why they haven't started talking about strikes. Roderick Smith wrote: That is only because of importing from UK: 'We don't have them, so those ruddy colonials shouldn't'. Nothing else shifts as many passengers per hour per track. The NSW passion is to kill the unions, not to transport people. Management keeps on propagating myths, and even transport enthusiasts fall for them. Meanwhile, Sydney has gone back to double-deck buses. Am I the transport enthusiast? There's quite a bit of discussion of this elsewhere in which you've been a participant. Nothing has a greater capcity than a single deck metro-type train. Your reading of double deckers is based on a false premise that they can carry 2,000 passengers in an 8 car train. You can absolutely jam in maybe up to 1,700 or so transporting from A to B at a special event, as long as nobody needs to get on or off along the way - because the big issue is DOORS, followed closely by stairs. On a regular basis they are good for maybe 1,200 passengers after which they become dysfunctional. The proposed metro trains for Sydney will be able to carry about 1,500 when fully expanded (about 1,200-1,300 initially I understand) at close headways. Secondly, much has been made of the example of Paris RER line A and its triple door (per side per car) double deckers at 30 trains per hour. A bit of further enquiry in France by several people has revealed that they're in fact struggling to keep up with that and they can't in reality get much past 24 trains and hour and they have had to automate the driving on the trains so that the driver can devote all of his/her time to managing the doors, because double deckers are poor at passenger exchange (unloading and loading). 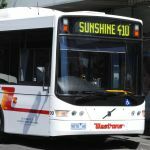 Thirdly, Sydney has not "gone back to" double decker buses but is applying them only in the limited circumstance that they have any value in urban transit, as long-distance, semi-express, limited-stop, low-turnover vehicles. Even the rather dense TfNSW has stated that they're not being considered for mass transit, high turnover work for which they're unsuited for the same reason as double deck trains. This is the domain of the single deck, multi-door bus. The doors issue is a myth, based on the idea that everybody climbs out at every station, and is replaced with a new load: not so. Australian systems are mainly tidal flow. The original concept was for a double door and a single on every mezzanine, and that was deemed unnecessary, and then management bleats about doors. The concept could still be applied to any future build. Victoria has embarked on a program of nine car single deck which still won't carry as many people, on a system which doesn't even have one nine car platform, and certainly won't get them around the whole system. Despite the bleats about 'don't fit', double-deck train clearances could be provided on all routes for way less than the cost of the Swanston St tunnel. The capacity of single deck trains on real metros comes from having perimeter seating, and people make short journeys, not extended commuter ones. Close enough, every seat removed makes space for one extra passenger (two standees take the same space as one seat). Comeng three car: 286 seats, 412 standees (I guess at 6 people per m^2), total 698. Double-deck four-car (shorter vehicles): 368 seats, 628 standees, total 996. On full-length then, 1400 vs 2000. 2000 was also the figure quoted for NSW, when it went to full eight-car double deck in the late 1960s. With approach speed signalling, the available dwell time for any train on 150 s headways is 110 s; on 120 s headways, 80 s. I have never seen a double-deck train need more than 70 s. In Sydney, they often stop for longer because of super slack timetabling brought in by panicking politcians a few years ago: the passenger aspects are finished. The misnamed 'high-capacity' trains in Melbourne won't be and can't be. Running seating designed for real metros to suburban commuting distances doesn't turn our misnamed metro into a real one. The 4D could theoretically have ran on every single line except the Clifton Hill group, and only because the Clifton Hill group was seemingly designed my the 7 Dwarfs just like the London Underground, where anyone who is over 5 feet tall probably has to duck their head to get in the train. Lower the tracks under those tunnels and the problem goes away - it's the reason why platforms 2+3 at Flinders St sit lower than the others (especially noticeable when the same types of train are next to each other in platforms 3 and 4). The Dandenong line will want their Comengs back if the new trains only have hard aluminum sideways-facing seats for the hour's trip! Tunnel height isn't the issue on the Clifton Hill lines. The two tight curves are. The 4D was a technical failure, and has zero bearing on the on the fanatical zealotry that seems to exist amongst some armchair enthusiasts about whether double deckers are good or bad. notch wrote: The 4D was a technical failure, and has zero bearing on the on the fanatical zealotry that seems to exist amongst some armchair enthusiasts about whether double deckers are good or bad. In what way was it a technical (I presume you mean engineering) failure considering its direct counterpart, the Sydney Tangara, has been quite successful? Double deckers are great for interuban and outer suburban express services where you want high seating capacity but fairly low turnover, meaning that passenger exchange/number of doors is not so critical. Sydney examples are services to Campbelltown and Penrith in the metropiltan area and all the interurban services. Somebody who knows the Melbourne lines better may care to nominate similar examples there. Heihachi_73 wrote: The Dandenong line will want their Comengs back if the new trains only have hard aluminum sideways-facing seats for the hour's trip! The extra 25 mins from Dandenong to Pakenham might stretch it a little, but this is where you'd perhaps deploy double-deckers. In what way was it a technical (I presume you mean engineering) failure considering its direct counterpart, the Sydney Tangara, has been quite successful? The fact that it was a one off orphan and was frequently out of service as a result awaiting parts as reported in enthusiast media of the time, especially towards the end of it's time. The giveaway is that it was scrapped despite being one of the newer members of the fleet at the time it was scrapped? 1970s Hitachi sets outlasted it! To be fair, it probably suffered from being a one off whereas the Tangara design it was based on was obviously a fleet design. I have no doubt that if only one Tangara set was built, it too would have suffered the same ultimate fate for the same reasons. Whilst the Tangara has lasted the distance, having ridden them up and down the North Shore line in the 1990s, I would be hesitant to suggest they were better than anything else around at the time. I always hated riding them in summer as the air conditioning never seemed to cope with the large expanse of upward facing window. The seats in the older sets were far more comfortable and usually reversible too unlike the Tangara. Perhaps more recent carriages have become less passenger friendly again meaning the Tangaras are regarded as a good design? I don't recall many positive comments in the Railway Digest at the time when compared to V sets which seemed to be the trainset idol. Double deckers are great for interuban and outer suburban express services where you want high seating capacity but fairly low turnover, meaning that passenger exchange/number of doors is not so critical. The problem though is that Sydney use them for all purposes. For the Blue Mountains line, double deck V sets did seem to work well. On the other hand, on the North Shore line with significant turnover at Chatswood, Gordon, North Sydney and a few other places it was annoying on a crowded train for a dozen people or so to get out whilst the upper and lower deck staircases emptied, then have to get back in again. Dare I say it, maybe a single deck metro is actually the appropriate solution given expected turnovers at places such as Epping, Macquarie Park, Chatswood, through Sydney, and possibly places on the Bankstown line? As for Melbourne, I can only really speak for the Hurstbridge line, but there are a number of turnover points such as Macleod (for LaTrobe Uni and Macleod College), Heidelberg (for the activity centre and hospitals precinct) and to a lesser degree Clifton Hill, that would make double decker operation less than useful based on the premise of low turnover apart from in the city. On the Belgrave / Lilydale line, I suspect it would be worse with Ringwood, Blackburn, Box Hill, Camberwell, Richmond being problematic, as well as possibly Nunawading and Mitcham to a lesser degree given nearby trip generators and interchange to Smartbus services. I have timed the turnover: never more than 70 s, at places considerably busier than the ones mentioned. Although single-deck may be faster at those places, it doesn't provide any benefit. Double-deck provides more passengers per hour per track, and that is the figure which counts. Increasingly, 60 s stops are becoming common because of the need for wheelchair loading and offloading. On real metros, people do move to the door before the train stops, because there are so many standees glaring at them to vacate the seat before a new lot board and queuejump. Roderick Smith wrote: Double-deck provides more passengers per hour per track, and that is the figure which counts. Assuming you can get a double deck operation down to the same headways as a metro (and going by Paris RER line A that's a big if, as we've seen in other discussions), the practical capacity of a Sydney 8 car double deck is about 1,200 passengers. Your figure of 2,000 passengers comes from a claim made in the 1960s when they first appeared. Sydney Trains tested the maximum capacity about a decade ago and found it was about 1,750, but only if nobody had to get on and off during the journey, i.e. they journey had to be express end to end like a special event train and was jammed so that nobody could move, like a sardine can. Even the two triple doors idea couldn't solve that. An equivalent-length single deck train will carry 1,400-1,500 passengers depending on the seating configuration and has the ability to be fitted with 3 to 4 doors per car per side, evenly-spaced, to optimise passenger exchange and distribution. Two-door double deck trains, no matter how wide the doors, suffer vestibule congestion because the distance from the doors to the centre of the car is too great to encourage people to move away from proximity to the doors. The Paris RER three-door double-deck cars have a higher practical capacity but then they struggle to maintain 2 minute headways (in fact they don't except in short bursts). Save the double deckers for longer journeys that are express to a certain outer point, then stopping. The Campbelltown fast trains in Sydney are a good example of an appropriate suburban application for double deckers. It seems to me that the Dandenong-Pakenham section of that line in Melbourne would be another application, indeed all the way out to Traralgon. Oh wait, didn't they pull the wires down? Doh!